Today is my birthday and, as in every year, on my birthday I always try to do something new to me. This year, in keeping with that spirit, I was evacuated from the State of Illinois building due to a bomb threat. I had gone downtown to renew my driver’s license – among my mottos: there’s no minute like the last minute – and had just reached the part of the process where I had paid when the evacuation order came through. We all filed out, getting a good look at the suspicious package, a brown roller suitcase standing in the middle of the rotunda, not really that far from us. First they moved us up to the main level and we waited by the escalators. Then we were moved outside. Then we were gradually eased farther back from the massive glass entryway – like Saint-Chapelle, the State of Illinois building is mostly glass – until we were across the street. Then the police cordoned off the building – a woman standing next to me moaned, oh no, not the yellow tape. TV reporters seemed to be everywhere, working the crowd, looking for pithy sound bites. Then the big square truck arrived. More police kept appearing, plus an ambulance, plus a squad of firefighters who stood in a tight anxious clump looking straight at the building. Then a blue cloth was thrown on the pavement from the big square truck, and pieces of equipment were laid out, and a young man began methodically donning the heavy, elaborate blast suit. Here is the interesting thing. At no point did anyone in the crowd seem particularly scared or concerned. Only one person fell apart, and she was having a tantrum over the great inconvenience to herself. Nor was there particularly a circus atmosphere. The mood was one of mild interest and reluctant acceptance. Almost all the people hanging around were there not because they were hypnotized with terror or rage or morbid curiosity, but because they had to be. They worked in the building and had to get back on the clock, or at least grab their coats and purses, or like me had been interrupted in the midst of some official process. It was all so drab. This is where we live now. We have made a world in which such things are ordinary, part of the atmosphere we breathe. Where the idea that someone might want to blow up an iconic government building, and that young people need to be ready to stop that at risk to their lives, doesn’t make us sad or fearful. It’s just one more sound bite. I’m not much better than anyone else in that regard. 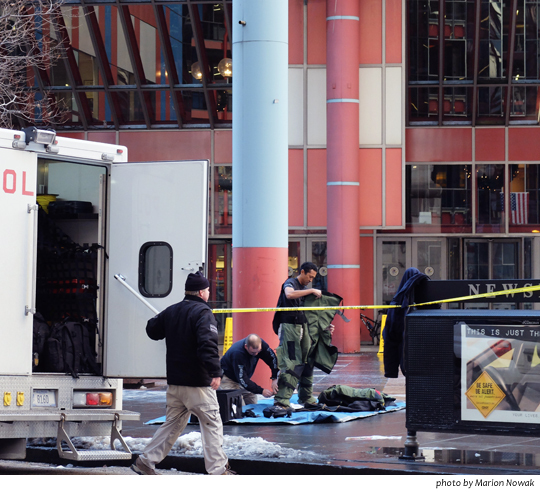 So the part of my day that hit me the most was standing on a Chicago street and watching a young man apprehensively encase himself in a blast suit and maybe, in a little while, be dead. Later tonight, when I am opening presents and having birthday cake chez moi, I will probably think of him. This entry was posted in Uncategorized and tagged birthday suit, blast suit, State of Illinois building bomb threat, Thompson Center. Bookmark the permalink. Love how the plan was to bring everyone past the suspicious package, almost like a wacky game of Russian Suitcase Roulette. Glad you are ok, and hope the blast suit guy is too. Wishing you a much more pleasant birthday evening, my dear!